you are welcome in our booth 12.109. Your business premises may have been built at a time when different requirements and standards applied. But that doesn’t make every type of older building obsolete and unfit for further use. Increasing the height of the roof converts an older building into one suitable for decades of further use thanks to the added functionality. T.C. van den Dool specialised in lifting and renovating industrial buildings. Your premises may have been used for other purposes in the past. Or perhaps your operational processes have changed and increasing the roof height would help boost your efficiency too. Lifting the roof creates space to install intermediate floors or room for more storage. The result is identical to a new-build – but without the associated costs and time factor. T.C. van den Dool can combine lifting the roof with an upgrade and renovation of your building. The walls can be extended or replaced to create more interior space and give the exterior of the building an entirely new look. T.C. 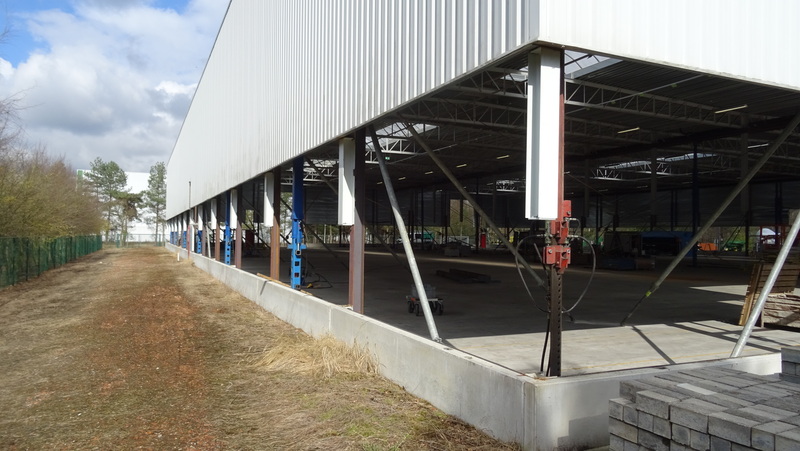 van den Dool uses a tried and tested method to lift your industrial building. A system of hydraulic props is used to gradually lift the roof. These props are interconnected using air lines. This ensures a very gradual, smooth process. Props and rising tensioners ensure the stability of the construction is safeguarded during the lifting process. The existing support columns are cut through, lengthened and reinforced. These steel support columns are produced by T.C. van den Dool in its own dedicated workshop. This allows us to handle every dimension of column. We are also responsible for all the engineering the project involves and we can coordinate the entire engineering and construction process for you. Our trained crew takes care of construction on site. After completion, you can always rely on T.C. van den Dool for after sales service. A lifted industrial building is also a reliable building. T.C. van den Dool works in compliance with the requirements imposed by insurance companies on structural buildings. T.C. van den Dool has experience with all types of industrial buildings. We are a professional and pleasant partner to work with: solution-focussed, effective and reliable. What can we do for your industrial building? Underneath you get an impression of lifting a roof of a shopping mall in Almelo (NL).